Application developed by Cuatroochenta for the leader group in the sale of fresh products in Panama, becoming the first of its kind in the Central American country. The App for Rey Supermarkets streamlines and improves the user experience on the 25 centers of the chain in Panama. 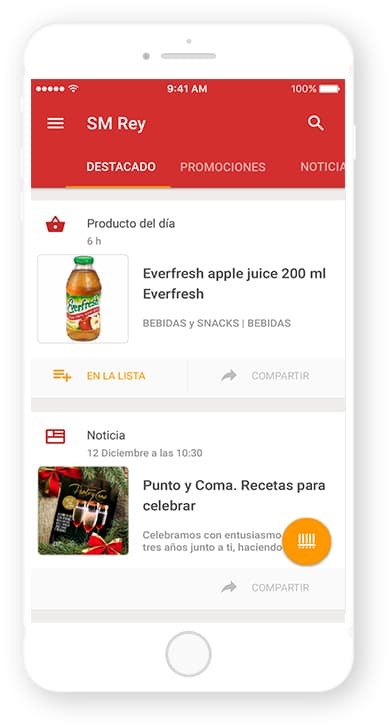 With this app the Punto de Oro loyalty card is on the smartphone; it also offers the possibility of planning the shopping list, check recipes or know the promotions real-time. Now available for Android on Google Play and soon on iOS as well. Scanner: allows users to capture QR and bar codes with the phone camera in order to consult product prices and all the information about your nearest supermarket, including offers. Shopping list: very useful to create shopping lists and plan food and household needs, adding and removing products quickly and easily and organize them by “pending” or “bought”. Punto de oro: registers and activates the Punto de Oro app card to check the accumulated points and the catalog of products to swap. Products: details on all the items of Rey Supermarket so that you know them before adding to the shopping list and buying them. Information about promotions: updated information about the promotions. Location: you will see which the Rey Supermarket nearer to your location is. Recipes: cooking tips of Rey Supermarket, with preparation instructions and ingredients that you can also add to the shopping list.